BRISBANE man Raptor won’t be wondering where his next few meals will come from after winning a unique photography competition showcasing the life of homeless and vulnerable men and women. Raptor, who has been living on-and-off homeless most of his life, was the winner of the first Life on the Streets Photography Exhibition, run by Catholic grassroots group Blind Eye Ministries to show the realities of living rough on the streets of Brisbane. While he was keen to show the rough and raw edges of his life, there was also a practical reason for entering the competition. “The other one was there was no food and I’ve been wanting to get a food voucher,” Raptor said. His winning image scored him a $500 gift voucher, and shows his neighbour reading the newspaper inside the shared kitchen of a well-known West End boarding house, which supports some of the city’s homeless including Raptor. “The reason that means something to me at the moment, not because I’ve won – I have a funny feeling Rob’s not going to be around too much longer,” Raptor said. “He hasn’t eaten for over a week so we keep taking food in, cleaning him up a little bit, emptying his bucket sort of thing. Raptor’s winning piece was among an impressive 850 photographs that were entered into the competition. Blind Eye Ministries volunteer Peter McMahon, who initiated the photography project, said out of the 50 disposable cameras the group handed out, 43 came back to the centre for processing. “One day I spent about seven hours and a half going through the 800 and got that down to 100,” Mr McMahon said. Eventually 20 photographs were chosen as finalists for the exhibition, which will be on display at the Blind Eye Ministries’ drop in centre in South Brisbane all of this month. 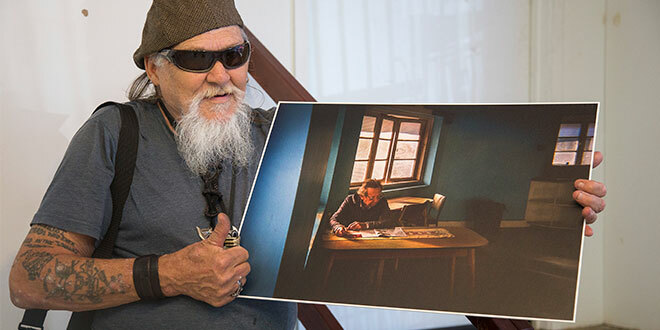 Life on camera: New Zealand man Paulie, who lives under the Kurilpa Bridge, with two of his photographs for the Blind Eye Ministries’ Life on the Streets Exhibition. His photographs were among the 20 in the competition’s finals. Photo: Emilie Ng. 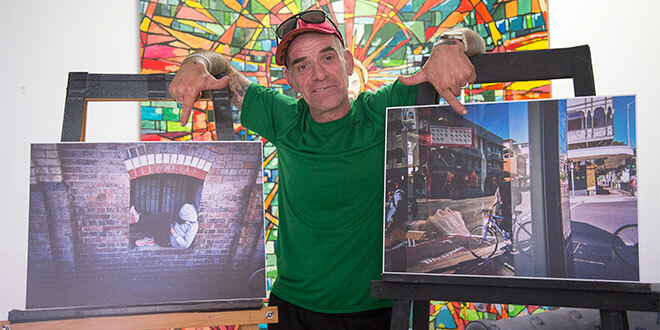 New Zealand man Paulie, who lives under Brisbane’s Kurilpa Bridge, had two photographs in the finals, including one taken the day he became homeless. The photograph shows a reflection of Paulie in a shop window carrying everything he owns in a small backpack. “It was me own fault,” Paulie said about ending up on the streets. “I’ve got a pretty supportive family but they’re all in New Zealand. 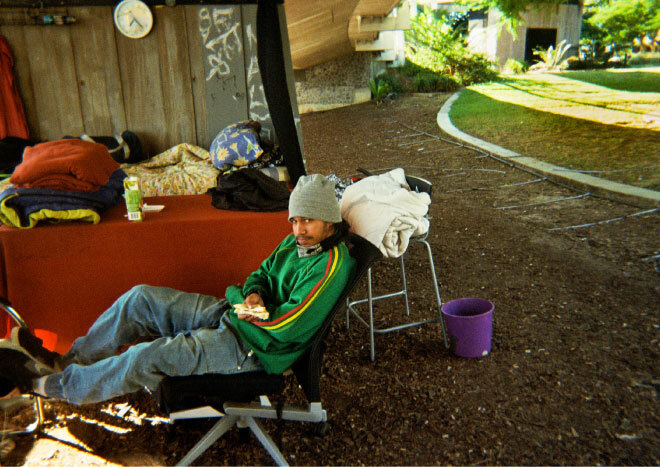 “They don’t know what’s going on at the moment, I haven’t told them I’m homeless living under Kuripla Bridge. “My mother’s crook at the moment, so I don’t want to make anything worse for her. “But I’ve made my bed so I’ve got to lay in it. Paulie is a regular at Blind Eye’s drop in centre, and said all the homeless and vulnerable who walked through their doors owe them their lives. “We’d be lost without it,” Paulie said. “They’re a blessing in disguise. “To be able to come here, have a feed, have breakfast, charge your phone, have a sleep, and just be able to relax and unwind until mid afternoon four days a week – we’re pretty lucky. Paulie hopes people who see his photographs will understand “what we go through and our day-to-day lives”. Mr McMahon, who is an amateur street photographer, said everyone including himself were blown away by photographs submitted to the exhibition. “There’s quite a lot of photos here that when I was going through it I said to myself, ‘I wish I had taken that’,” Mr McMahon said. Street life: One of the photographs shortlisted in the exhibition’s finals. Photo: Supplied. Living rough: A woman sits on her makeshift bed under a Brisbane bridge. Photo: Supplied. Real lives: A photograph of two men on the streets of Brisbane was entered into the exhibition. Photo: Supplied. 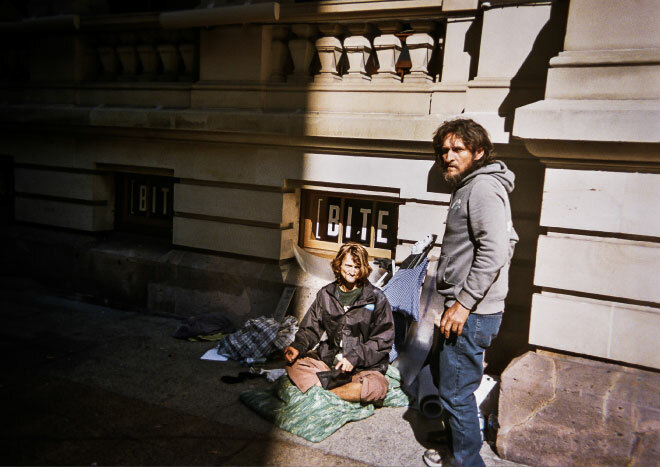 Mr McMahon said the final 20 photographs told a moving story about homelessness in Brisbane. “I think a lot of the photos individually are wonderful photos but I think the collective 20 tells a really important story about what it’s like to be homeless,” Mr McMahon said. “I think you need to see them not just as individual photos but as a story of what it’s like. “That was what it’s all about, life on the streets. Mr McMahon said the exhibition had attracted more attention than they anticipated, including a visit from the ABC’s 7.30 program and airtime on ABC Radio Brisbane. Their story was aired nationally on ABC 7.30 last week. Blind Eye Ministries director Roby Curtis said the project could not have happened without the support from the Catholic community, including 10 Catholic schools that sponsored the prizes for the finalists. Life on the Streets Photography Exhibition will be on display at 19 Merivale St, South Brisbane QLD 4101 from 9am to 3pm on Tuesday, Wednesday, Thursday and Saturday throughout August.